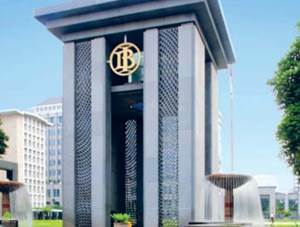 Bank Indonesia - BI is the central bank of Indonesia. BI is an Indonesian independent government instritution which was formed by the Government of Indonesia on 1 July 1953. As the central bank of Indonesia, BI has the single objective of achieving and maintaining the Indonesian currency Rupiah (IDR/Rp) stability. According to the Bank Indonesia Act, BI has tasks to formulate and execute monetary policy, regulate and maintain a smooth payment system; regulate and supervise banks. Bank Indonesia has its legal domicile in Jakarta and now has 37 domestic branch offices and 4 overseas representative offices at Tokyo Japan, Singapore, London UK, and New York USA. Bank Indonesia's head office is located at Jl MH Thamrin No 2, Jakarta 10350. According to Bank Indonesia's profile as cited by JobsCDC.com, Bank Indonesia is led by the Board of Governors. The Governor and senior deputy governor of Bank Indonesia are nominated and appointed by the President of Republic of Indonesia with approval from the People's Representative Council (DPR). In 2014, the Board of Governors of Bank Indonesia consisted of the Governor, Senior Deputy Governor and four Deputy Governors. Since 23 May 2013, the Governor of Bank Indonesia is Agus Martowardojo (formerly the Finance Minister of Republic of Indonesia and CEO Bank Mandiri). Graduated from Undergraduate Program (S1) or Master's Program (S2) with GPA min. 3.00 within 4.00 scales. 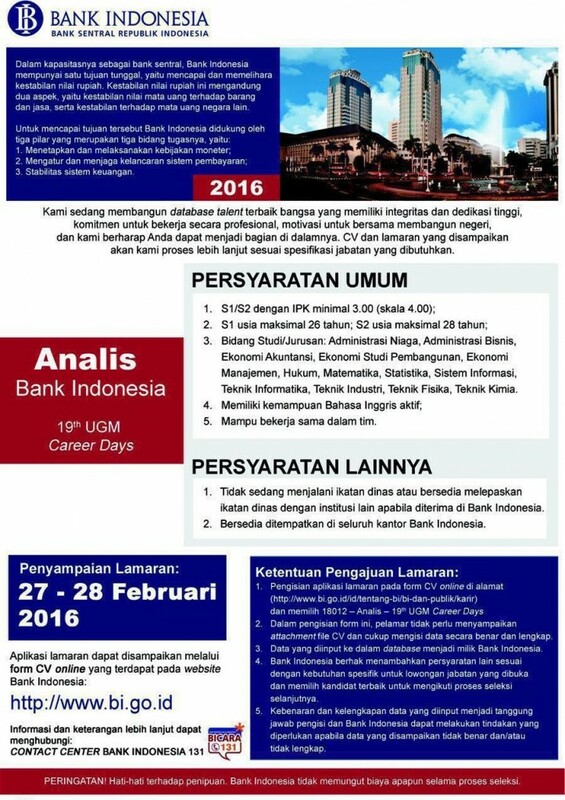 Willing to be assigned in all offices of Bank Indonesia. JobsCDC.com now available on android device. Download now on Google Play here. Please be aware of recruitment fraud. The entire stage of this selection process is free of charge. Bank Indonesia - S1, S2 Analyst Database Talent Program BI February 2016 will never ask for fees or upfront payments for any purposes during the recruitment process such as transportation and accommodation.